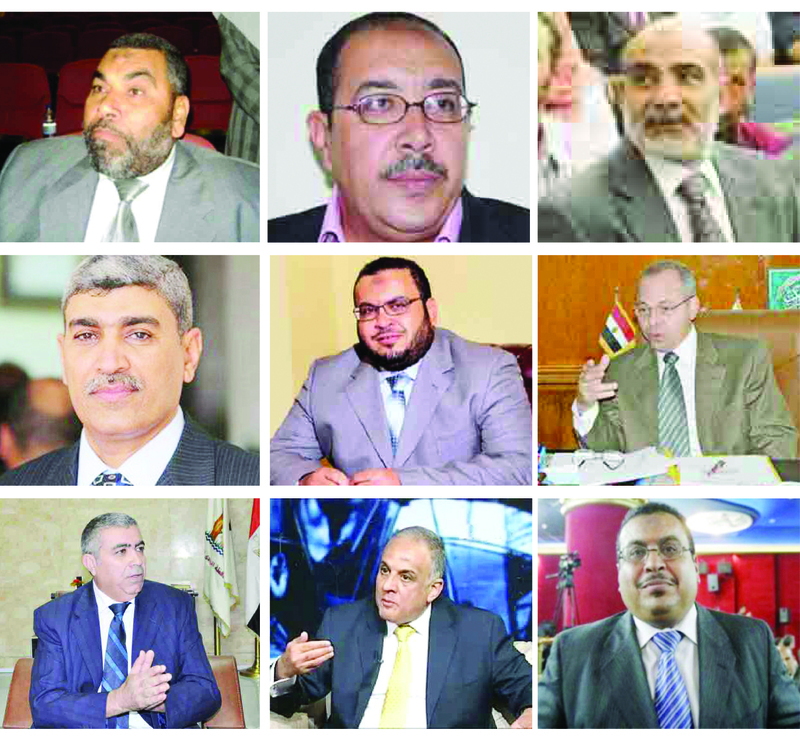 6 January: A cabinet reshuffle brings ten new ministers to Hisham Qandil’s cabinet, including four members of the Muslim Brotherhood and a new interior minister Mohamed Ibrahim. 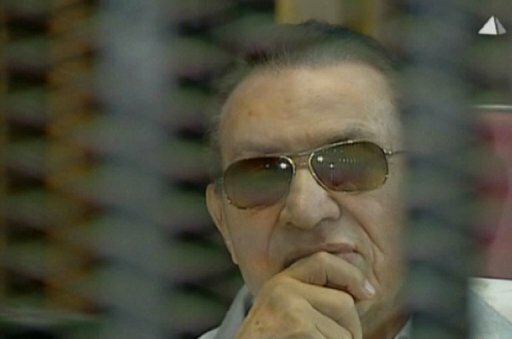 13 January: The retrial of former president Hosni Mubarak, his interior minister Habib Al-Adly, and six aides is announced in the case of failing to stop the killing of protesters in January 2011. 15 January: A train crash in Badrashein, Giza leaves 19 Central Security Forces (CSF) conscripts dead and 117 injured. 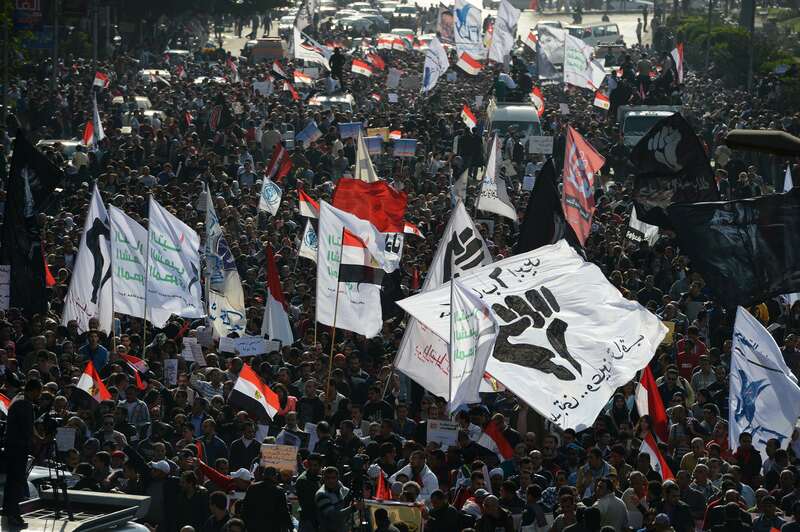 25 January: Protests against President Mohamed Morsi and the Muslim Brotherhood mark the second anniversary of the 25 January Revolution. 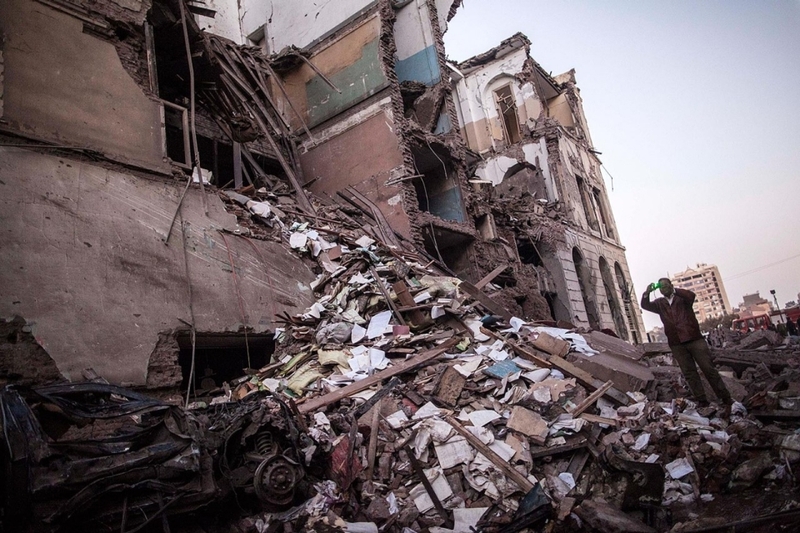 26 January: Port Said descends into chaos following the sentencing of 21 people to death for the killing of at least 72 football fans in a February 2012 match. 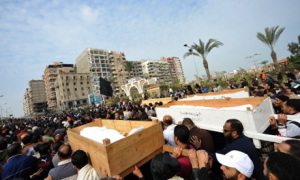 Subsequent violence in Port Said, and in the other two major canal cities of Ismailia and Suez, result in approximately 33 deaths. 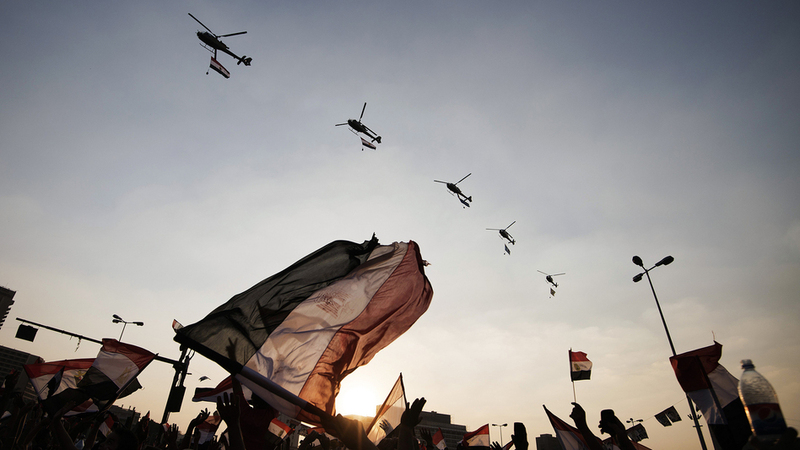 27 January: In reaction to ongoing violence, President Morsi calls for a state of emergency in the three canal governorates and a curfew of 9 pm-6 am. 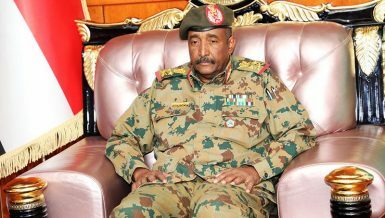 He also called for national dialogue but National Salvation Front (NSF) parties decline, reiterating demands for a modified constitution. 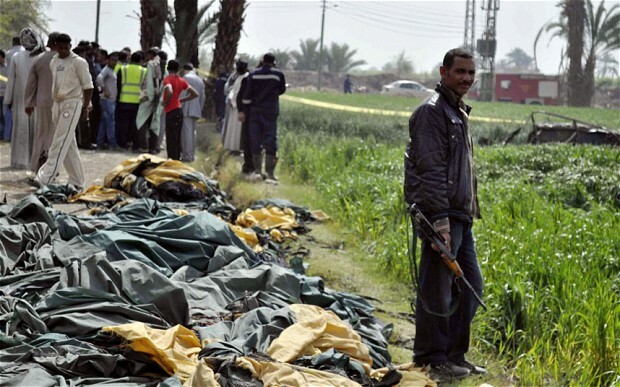 26 February: A hot air balloon crash in Luxor kills 19. 6 April: Sectarian clashes rock the town of Al-Khosous. The aftermath leaves seven dead. 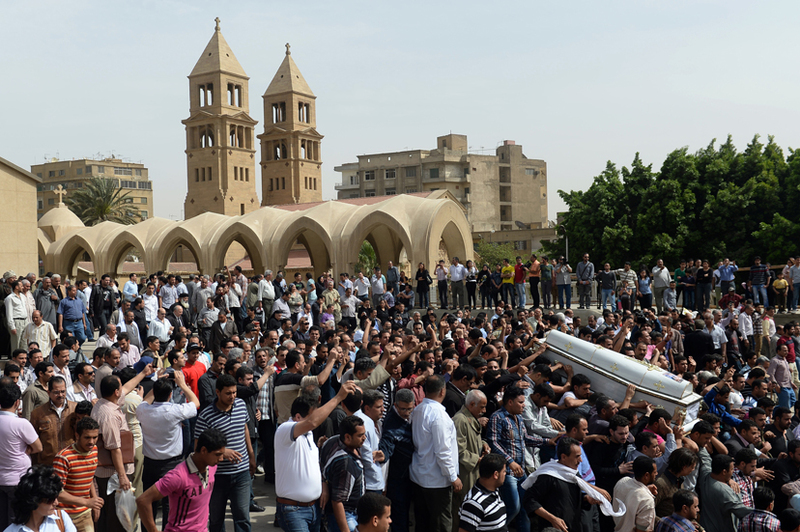 7 April: Following a funeral at Saint Mark’s Coptic Orthodox Cathedral for the dead from the sectarian clashes the day before, mobs and police attack mourners and the premises of the papal headquarters. 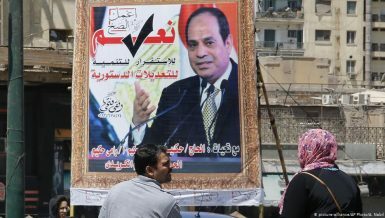 28 April: The Tamarod campaign is launched and announces that it will aim to collect more signatures withdrawing confidence from Morsi than votes he received in his 2012 election victory, calling for early presidential elections. 7 May: A cabinet reshuffle is announced, bringing nine new ministers to the Qandil government. 16 May: Unidentified gunmen kidnap seven off-duty security personnel in Sinai. 22 May: The seven hostages are released, and the presidency claims no negotiations took place with the kidnappers, who remained unidentified. 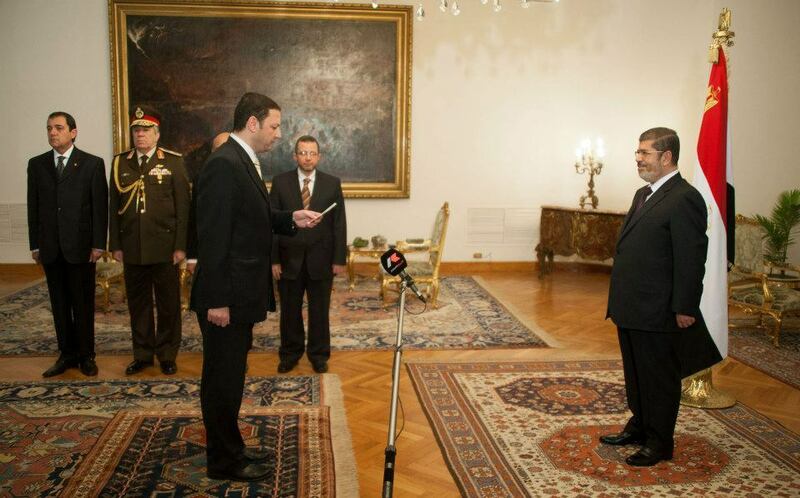 16 June: Morsi appoints new governors. Seven of the 16 new governors are members of the Muslim Brotherhood, and the appointments are met with criticism from opposition groups. 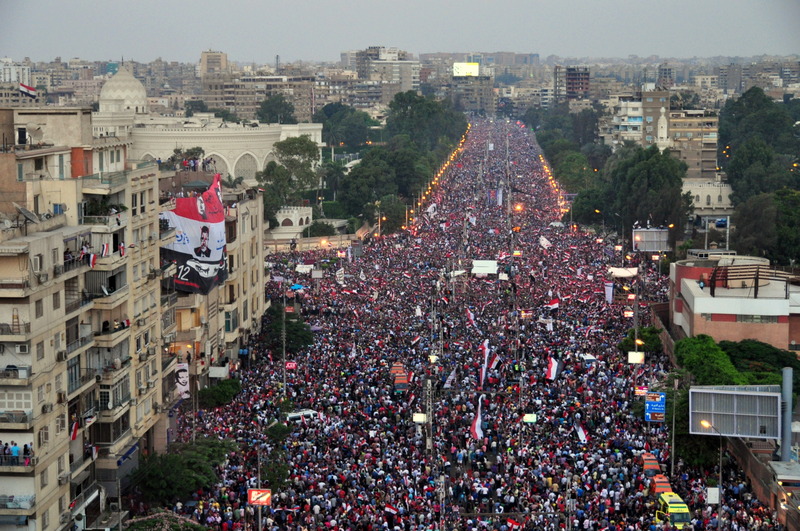 30 June: Massive nationwide protests begin against President Morsi. 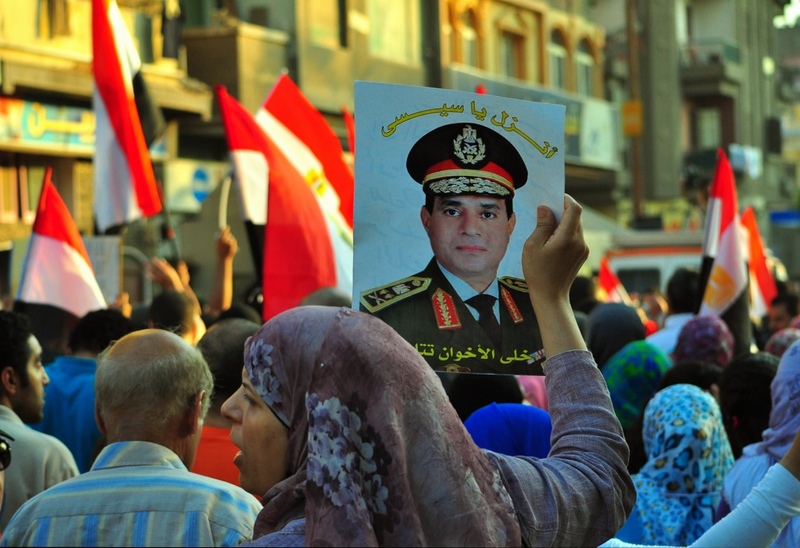 1 July: Minister of Defence Abdel Fattah Al-Sisi gives Morsi a 48-hour “ultimatum” to come to an agreement with opposition groups, saying the armed forces would provide its own solution if he failed to do so. 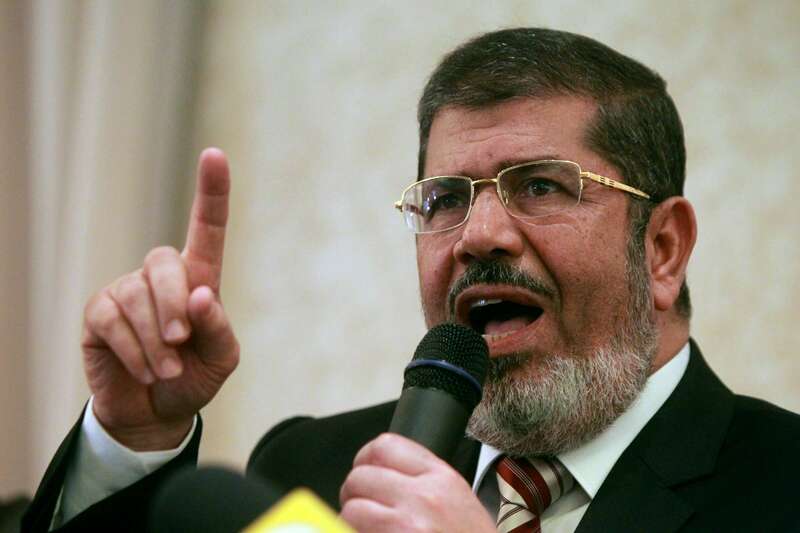 2 July: President Morsi gives a speech emphasising his popular legitimacy and vows to defend it. 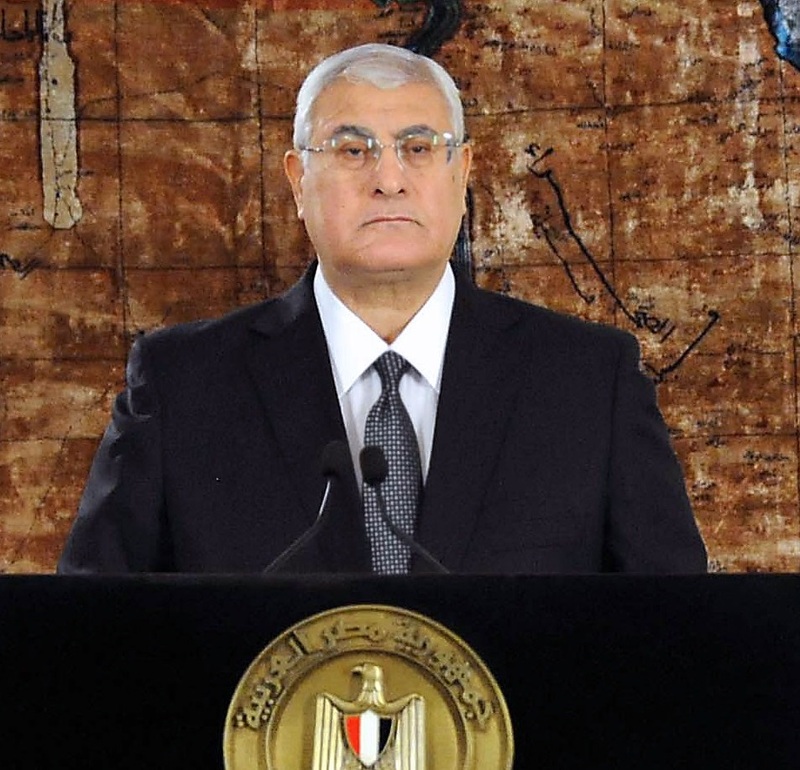 3 July: Al-Sisi announces Morsi’s removal from power and states that head of the Supreme Constitutional Court Adly Mansour will assume the position of interim president while a transitional roadmap is executed. 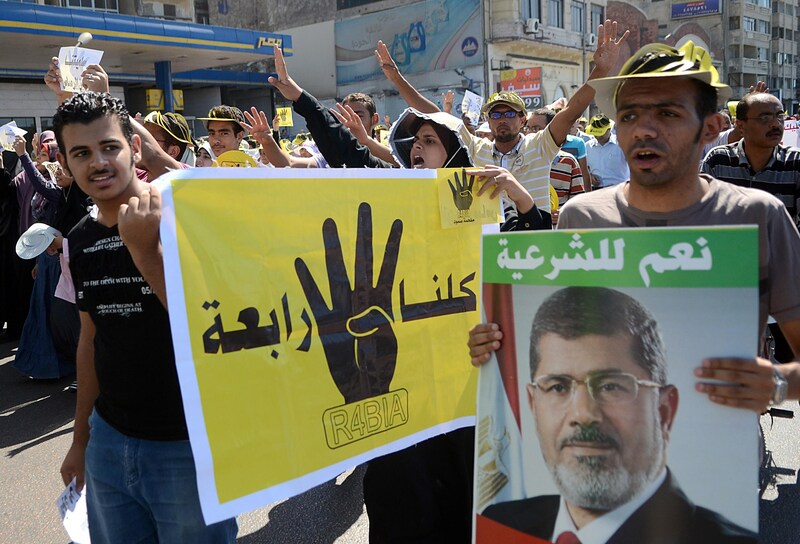 Morsi and his presidential team are detained by the Republican Guard. 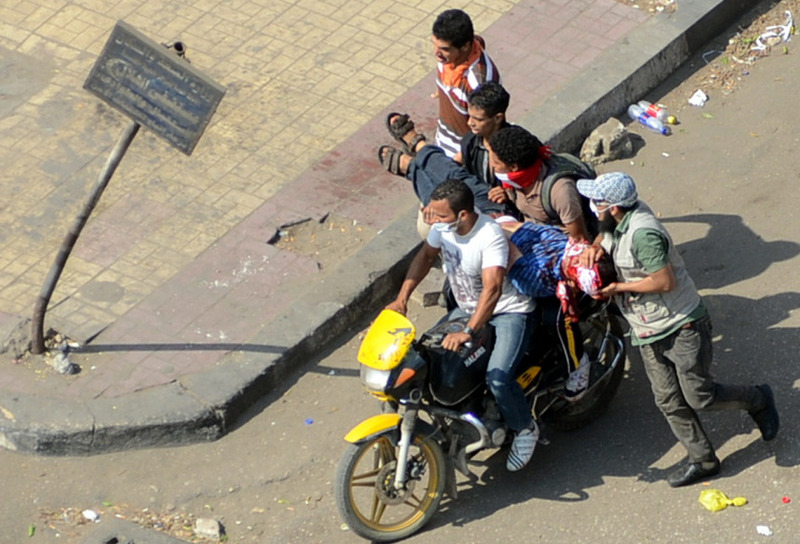 5 July: Five protesters are killed outside the Republican Guard Club, near the pro-Morsi sit-in at Rabaa Al-Adaweya. 8 July: At dawn 61 protesters are killed outside the Republican Guard Club. One police officer and one military officer are also killed. 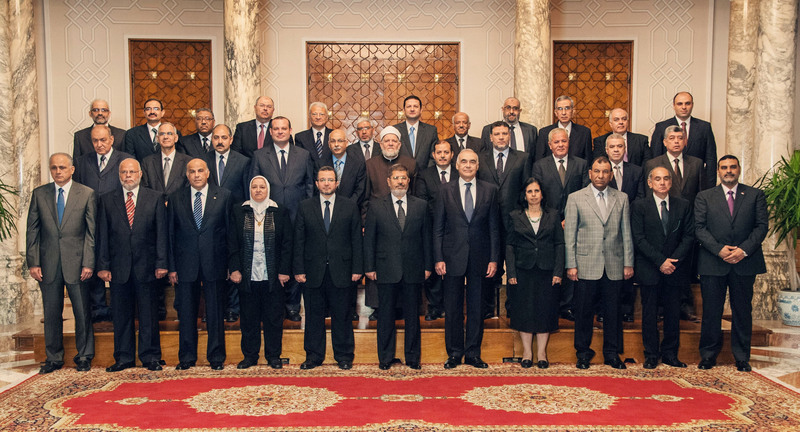 16 July: The new interim government, consisting of 34 ministers, is sworn in at the presidential palace. 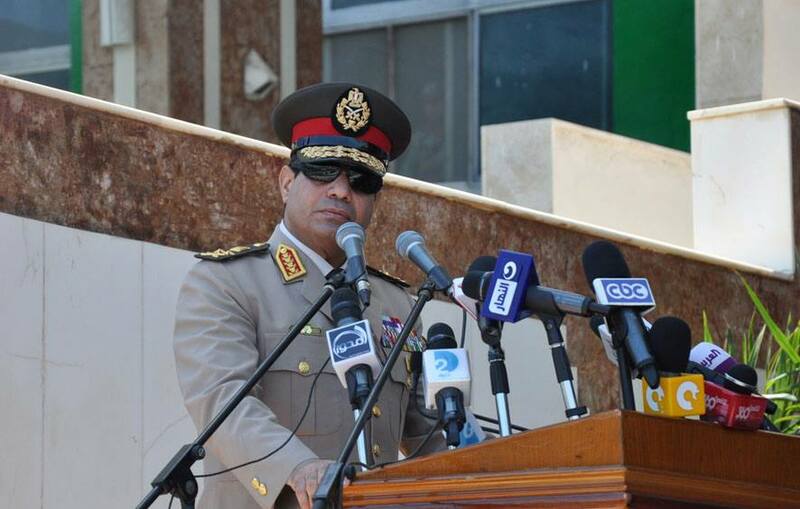 24 July: Al-Sisi calls on Egyptians to demonstrate the following Friday to give the armed forces and police “authorisation” to confront terrorism. 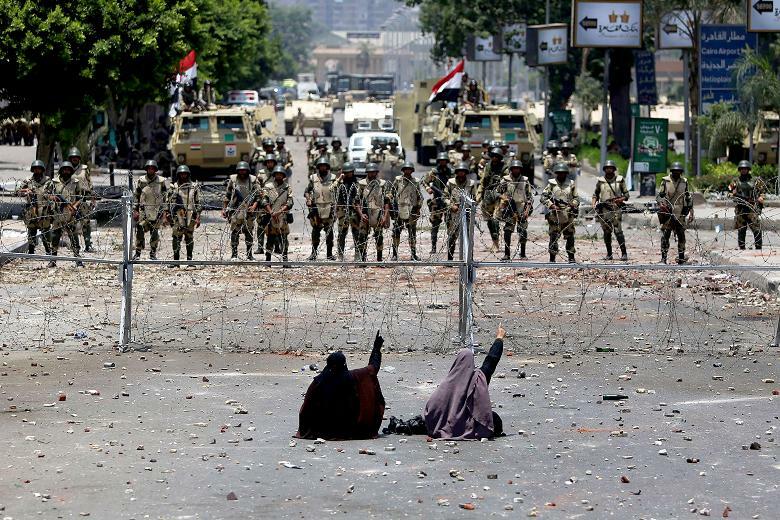 27 July: 95 protesters are killed on Nasr Road in the morning, according to Human Rights Watch, which also accounted for one dead policeman. 13 August: Mansour appoints 20 new governors. 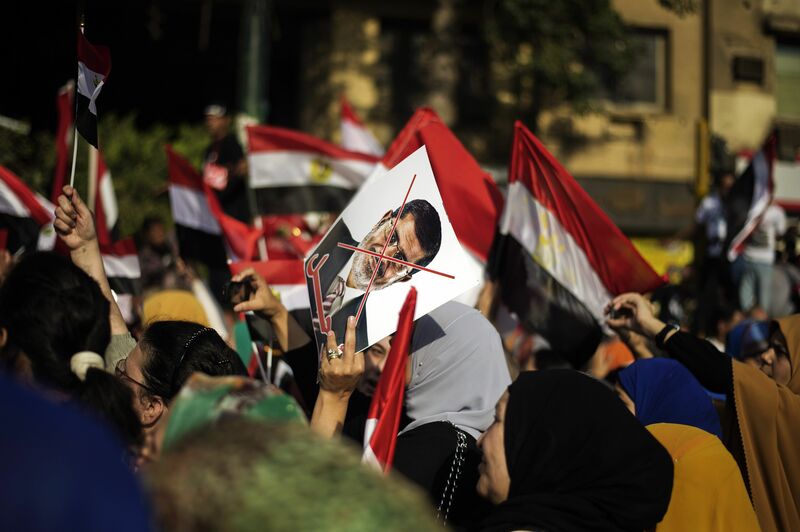 14 August: In Egypt’s single bloodiest day since the revolution, security forces violently disperse the pro-Morsi sit-ins at Rabaa Al-Adaweya and Nahda Square. Security forces also disperse other protests around the country. 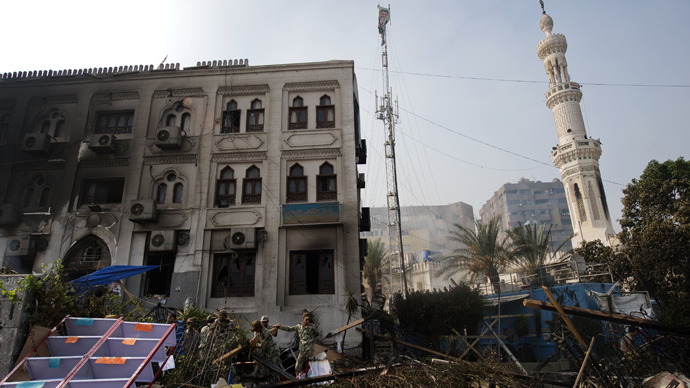 Some Morsi supporters attack police stations and dozens of churches and Christian-owned properties throughout the nation. 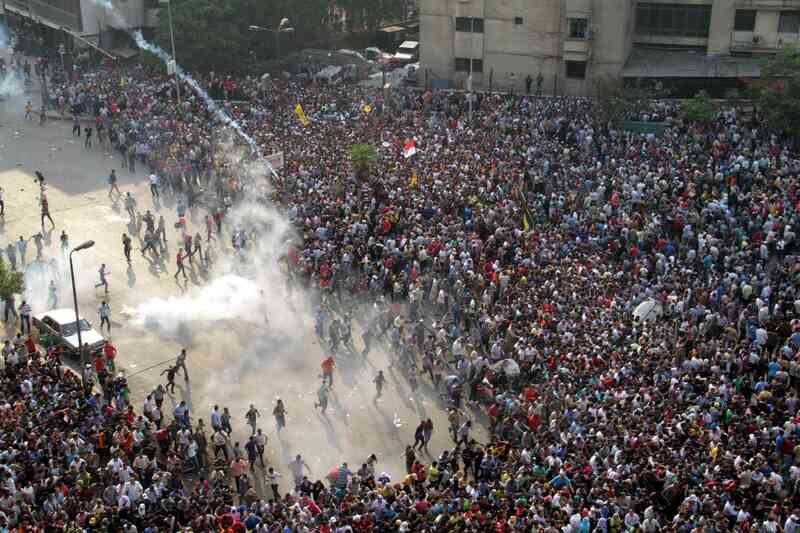 16 August: Deadly clashes erupt in Ramses Square in which 120 people and two police officers are killed. 17 August: Thirty-seven detainees in a police vehicle are killed while being transferring to Abu Zaabal Prison. 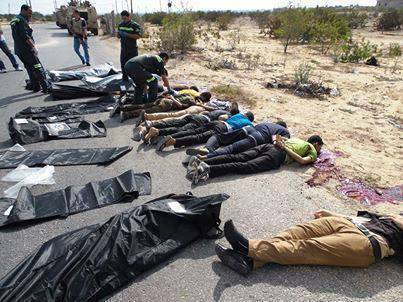 19 August: Twenty-five conscripts were killed in Rafah after attackers took the buses they were on and proceeded to kill each of them execution-style. 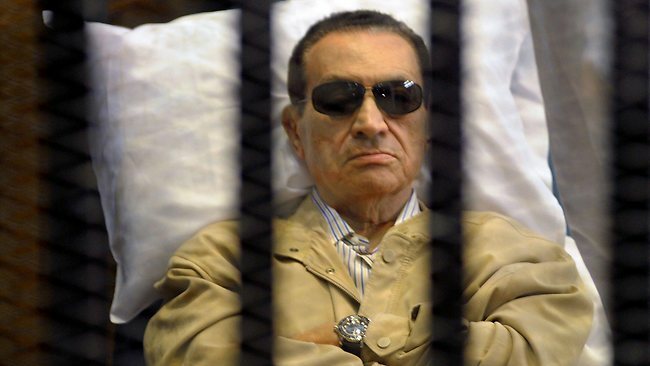 21 August: The release of Hosni Mubarak is ordered. 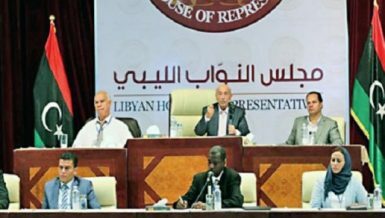 1 September: Mansour issues a decree and forms the Committee of 50, tasked with amending the suspended 2012 constitution. 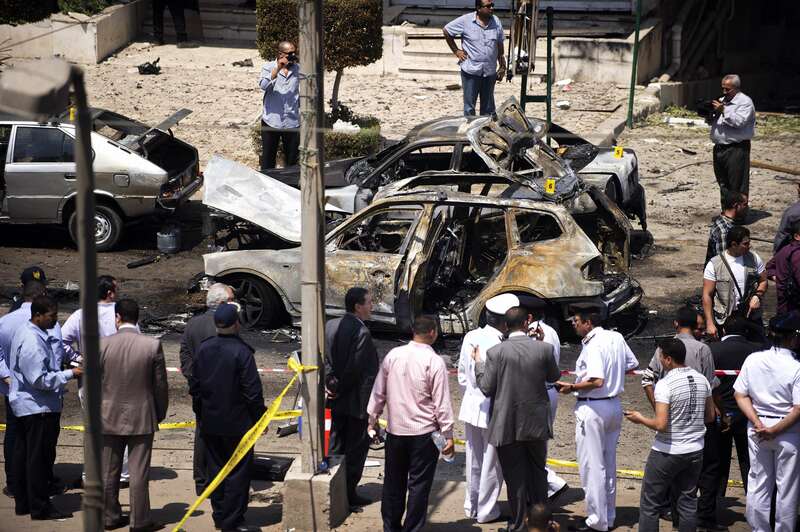 5 September: Minister of Interior Mohamed Ibrahim survives an assassination attempt in Nasr City. 6 October: Pro-Morsi marches are confronted by police in the Giza neighbourhood of Dokki and Ramses Square, leaving 57 protesters dead. 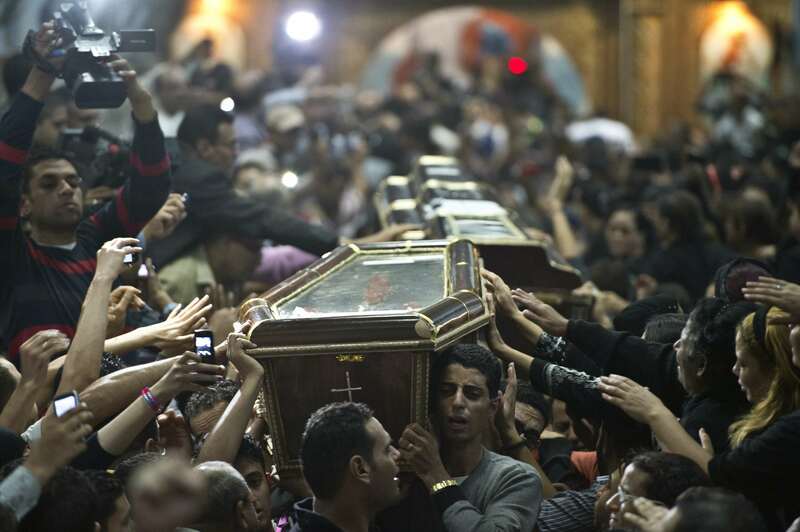 20 October: A shooting during a wedding at the Virgin Mary Church in Al-Warraq, Giza kills five. 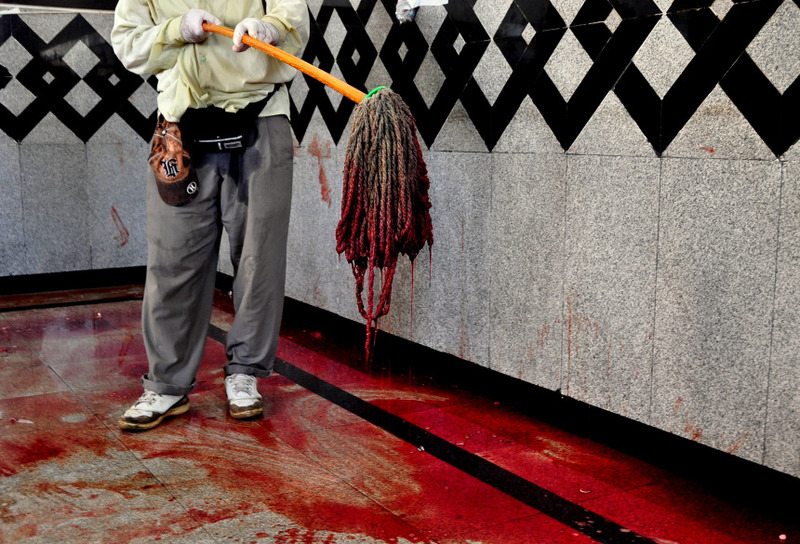 4 November: Morsi attends his first hearing on charges of inciting violence and murder. 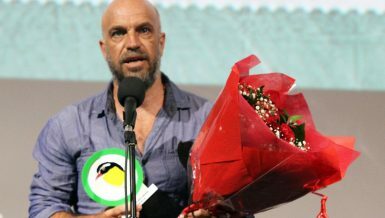 It is his first public appearance since his ouster, and he refuses to wear the customary white for defendants. 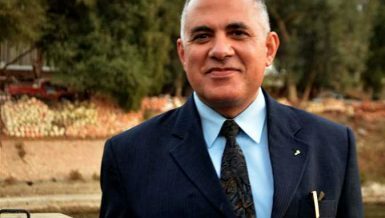 Following the hearing he is transferred to Borg Al-Arab Prison outside of Alexandria. Thousands of his supporters protest, calling the trial illegitimate. 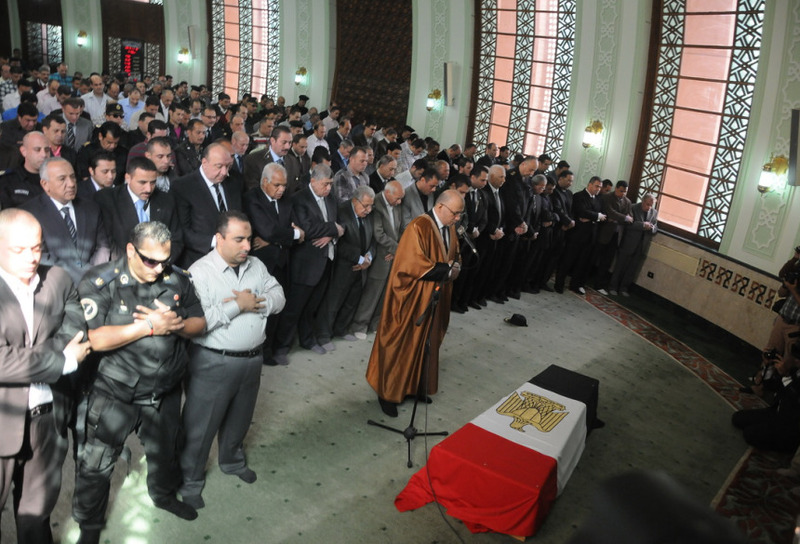 17 November: Lieutenant Colonel Mohamed Mabrouk is assassinated outside his home in Nasr City. 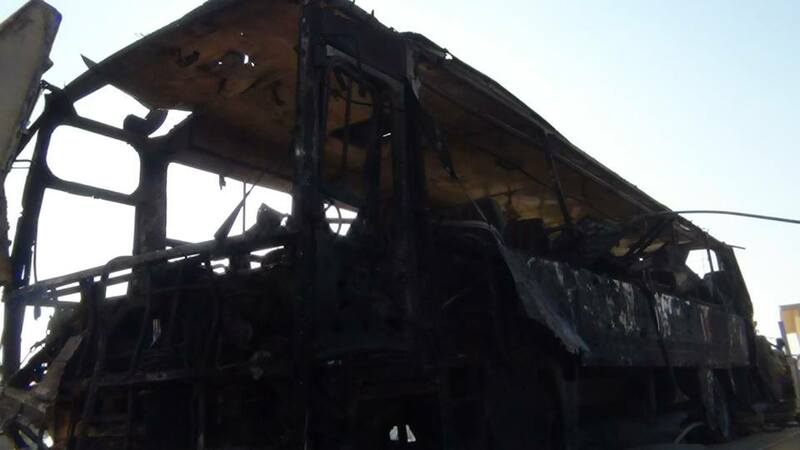 20 November: A car bomb is detonated in Sinai, killing 11 soldiers on a bus. According to the armed forces, 37 were injured in the blast. 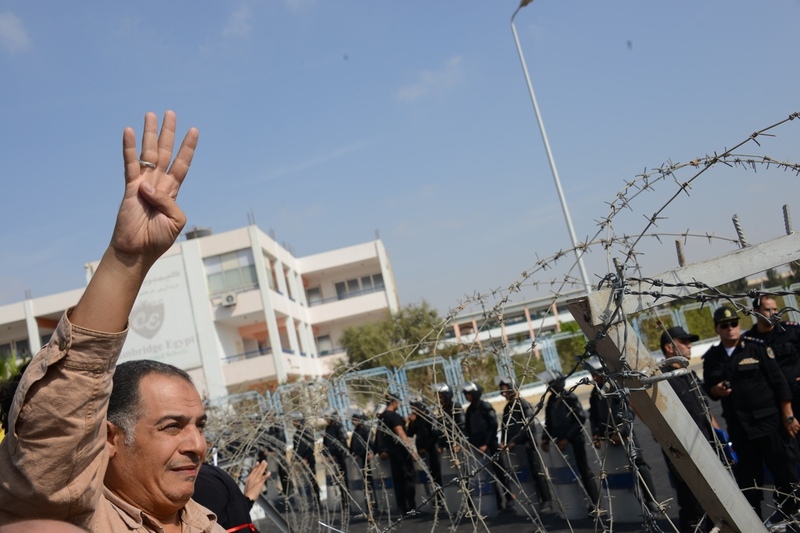 26 November: Dozens of activists are arrested in front of the Shura Council after police dispersed the demonstration, which did not comply with the newly-issued controversial Protest Law. 30 November: The Committee of 50 finalises and passes the proposed constitution. 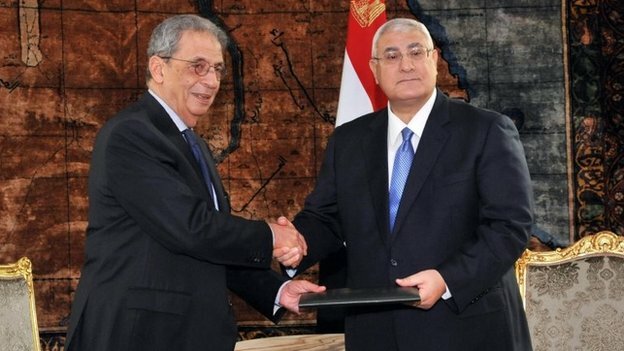 3 December: Minister of Military Production Reda Hafez dies at 61 years old. 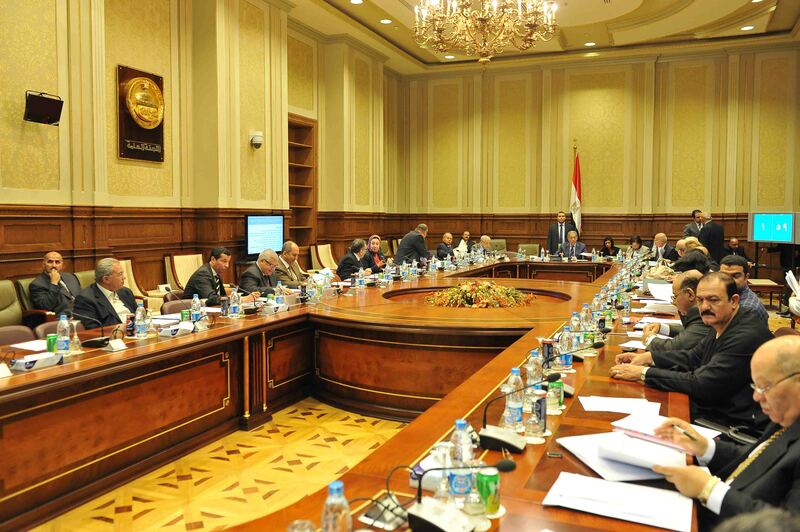 14 December: President Mansour announces that the constitutional referendum will take place on 14 and 15 January. 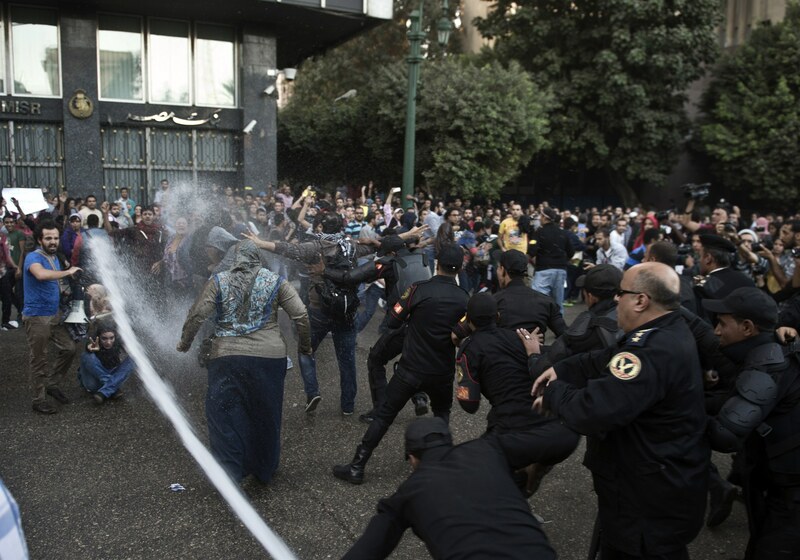 Police in other parts of the country also confront pro-Morsi protests and some supporters of the ousted president attack police stations and dozens of churches. 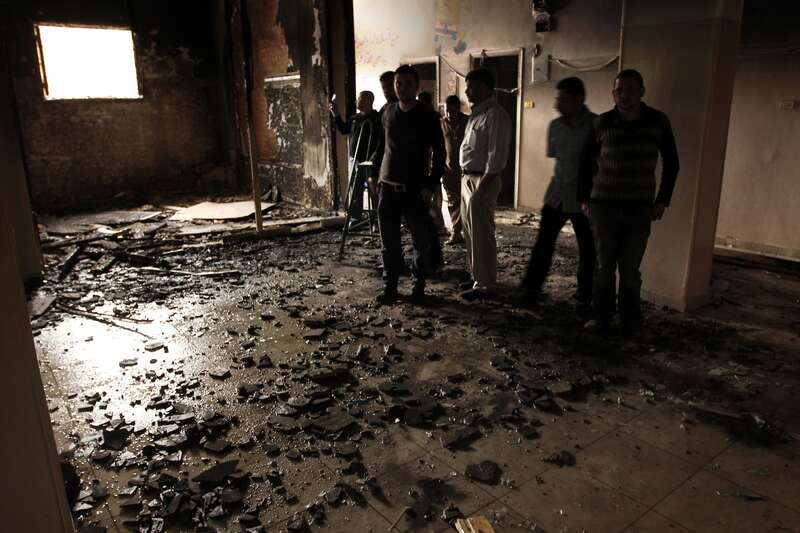 24 December: The Daqahleya Security Directorate in the delta city of Mansoura is bombed, killing 16. 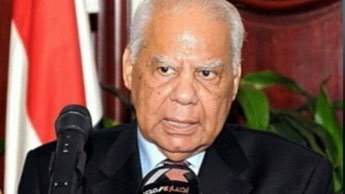 25 December: The cabinet declares the Muslim Brotherhood a terrorist organisation, referencing a prior court ruling that interim Prime Minister Hazem El-Beblawi vowed to implement “rigorously”.